The satellite launch system “Sea Launch” is moored in the Long Beach Harbor, Long Beach, California. Satellites are launched from the “Odyssey Launch Platform”, a semi-submersible former oil rig, after it has been towed out to the equator. The platform is accompanied by “Sea Launch Commander”, the Scottish-built ship moored just to east, which provides mission control and crew accomodation. For more on Sea Launch see the official site. very cool, I’d seen this in the Long Beach Harbor images but didn’t realize that it was Sea Launch. thanks! 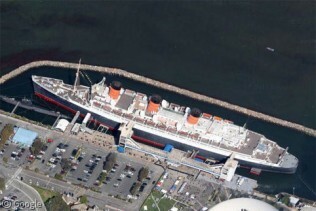 The platform is no longer on GoogleMaps imagery. 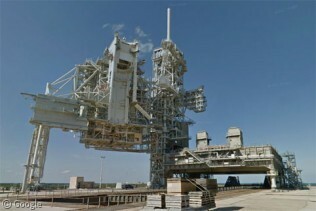 However, LiveMaps has some pretty awesome shots of both the vessel and the launch platform. Check it.